You can use Windows Media Player to create a playlist in Windows Vista. Playlist is simply a tool that tells Windows Media Player which are your favorite songs. You might want a playlist for each person in the family, or perhaps a playlist containing the music you like to listen to when you work and a different one for the music you like to listen to when you have a party. Playlists let you listen to your music your way. Click the Library tab and then click Create Playlist at the left under the Playlists item. The Create Playlist label disappears, and a text box opens in its place. Enter a playlist title there and then click outside it. A blank playlist appears in the List pane on the right. Click a library in the left pane of the Media Library, and the library contents appear. Click an item and then drag it to the new playlist. Repeat this step to locate additional titles to add to the playlist. Building a playlist in the List pane. When you finish adding titles, click Save Playlist. 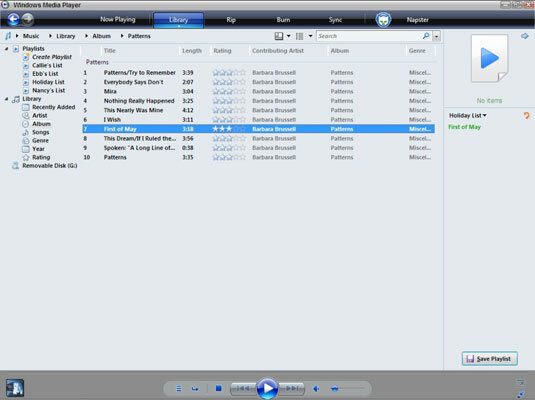 To play a playlist, click it in the Library pane or the Navigation pane and then click the Play button. Choose Sort to sort the playlist by title, artists, release date, and so on. Choose Shuffle List Now to randomly reorganize the titles to play in a different order. Choose Rename Playlist to give it a different name. Choose Skipped Items to indicate how to deal with tracks you have skipped. 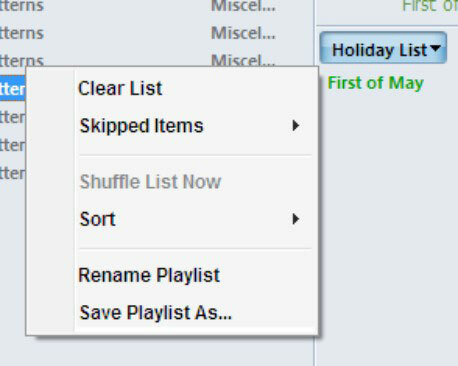 You can also right-click a playlist in the Library pane and choose Play to play it or choose Delete to delete the list. Don’t worry, you aren’t deleting the songs from the library, just the instructions on how you like them played in that particular playlist.